SPORT and Recreation Minister Makhosini Hlongwane has acknowledged that Team Zimbabwe failed the nation at the just-ended Olympic Games, attributing the poor showing at the global sporting showcase to lack of planning. 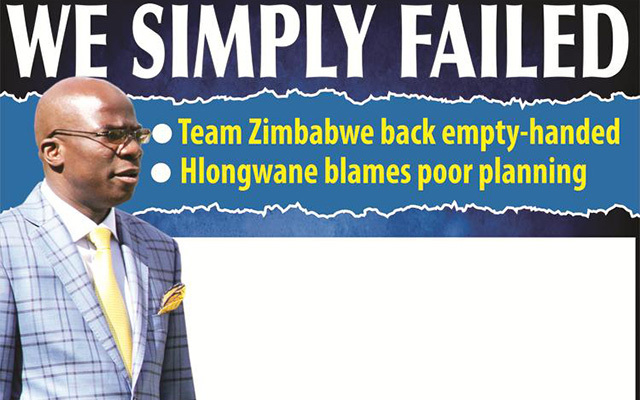 As Team Zimbabwe returned home empty-handed, Hlongwane noted that there had never been a real plan for the Games despite the Olympics coming after every four years.There are also genuine concerns that Zimbabwe’s chances of getting medals have dried up since Kirsty Coventry last fished some from the swimming events in Athens 2004 and Beijing 2008. This could also be the story at the 2020 Games in Tokyo, Japan, if the trend of improper planning continues. This is the second Olympics in a row where Zimbabwe have failed to win a single medal. It was a similar tale at the 2012 Games in London. Hlongwane said the team’s performance is a reflection of how Zimbabwe, as a country, approached the Games. “The performance of Team Zimbabwe in the recently ended edition of the Summer Olympics Games in Rio shows that we did not consider the Olympics as a four-year cycle. In other words, two years ago, three years, and four years ago there were no seeds that were planted to begin the process of preparing the athletes for Rio 2016. “Olympics are a four-year cycle. What that means is we must always, on time, make sure that the preparations are done. For Rio, when we are talking about the team that we were assembling beginning of this year, late last year it was already late. “Work had already not been done prior to that, so I want that to be very clear,” said Hlongwane. Since independence, Zimbabwe have won eight medals at the Olympics. The first medal came from the women’s hockey team in 1980 in Moscow, Russia. It then took Zimbabwe 24 years to add to that medal through swimming icon, Coventry, who has won seven of the country’s medals. The swimming sensation won three medals at the Athens Games in 2004 — gold, silver and a bronze. She went on to claim four more medals for Zimbabwe at the Beijing Games in 2008 — one gold and three silver to take her tally to seven. But with age catching up with Coventry, it was always going to be difficult for her to repeat the same feat in the past two editions — 2012 and 2016. Now it appears Zimbabwe have gone back to the pre Coventry era when medals at the Games were elusive. Hlongwane said going forward there was need to start planning and preparing for the next Games early, which is Tokyo, Japan in 2020. “How are we going to bring this situation to normalisation? We are starting the preparations for Tokyo 2020 this year. I have already asked the Zimbabwe Olympic Committee to come and have discussions with myself and my team, so that we start preparations for Tokyo 2020,” said Hlongwane. The Ministry of Sport and Recreation recently adopted the Sports and Recreation Policy to address various issues concerning sport including development of sport from grassroots level. Hlongwane said they have met with ZOC and the Sports Commission to discuss the implementation of policy with a view of producing the best athletes from across the country. The Sports Minister said they are also revising the format for the National Youth Games to include all Olympic sport codes and broaden the Games so that they can make a significant contribution in producing world class athletes. Zimbabwe’s National Youth Games have largely resembled a social gathering with very little interest from the nation. “The major emphasis of the programme that we are rolling out, which is the consequence of the coming out of the policy is the whole idea of identifying the best talent. But beyond, that in the laboratory of the National Youth Games, which begin from the grassroots, a major component of that is that this laboratory must process that talent. It must develop that talent. “We are doing this on an annual basis so that we keep track of the best athletes that we have from various sport codes, especially the active sport codes,” said Hlongwane. Some of the local athletes have benefited from the Olympic Scholarship programme whose funding is administered and managed by the Olympic Solidarity, which is the arm of the International Olympic Committee. The programme offers national Olympic committees the possibility to obtain financial and technical assistance for a limited number of elite athletes who will be training and attempting to qualify for the Olympic Games and 10 athletes from Zimbabwe benefited from the scholarships in 2014 as a build-up to the 2016 Games. Of the 10 Coventry, sprinter Gabriel Mvumvure, rower Micheen Thornycroft, Wirimai Juwawo and Cuthbert Nyasango were part of the team that represented Zimbabwe in Rio. However, there have been calls for more support from the Government to complement such efforts since this is limited to a few athletes. Sports Commission acting director-general, Joseph Muchechetere, conceded that currently there is no supporting system to enable athletes to compete for medals at international events. “The team did its best considering that competition at that level is stiff. But because of a number issues we could not match the international standard. “The economic setup of ourselves, particularly the athletes who are training here, all those local athletes they train under difficult circumstances compared to their counterparts. “We need to also ensure as a country we up our gear to create a supporting environment. We are lagging behind in terms of training facilities. If we look at the sport infrastructure, it’s nowhere near the international standards. Hlongwane, however, said they should have a clear resource mobilisation strategy in place soon to address the funding of sport. “The whole issue of the economy of sport is obviously a crucial matter in terms of funding sport. One of the things that I promised the nation upon my appointment was the instalment of a national sport and recreation fund. “We have since changed that to a sport, recreation and wellness fund. In the next few weeks we should be having a very clear resource mobilisation strategy for sport, recreation and wellness in our country. That is going to be taken care of. “And where we are able to raise resources in the kind of manner that I anticipate, we need to be able to build new infrastructure so that we are also able to host for example the AFCON games so this is crucial for us and is something we are really investing in,” said Hlongwane. Zimbabwe fielded a team of 31 athletes in athletics, archery, and equestrian, football, rowing, shooting and swimming.